And no, I don't mean the latin dance. I mean that my house is overrun with a thousand ripening tomatoes, and we are just trying to keep up! I learned something new, by the way! I figured out how to add text anchors here, so people don't need to read my ramblings and can just go straight for the recipe. I went back and tested it on a bunch of older posts, so now my posts will begin with "Jump to Recipe". Don't mention it. This year, I thought it would be a grand idea to plant 130 tomato plants. I started them, from seed, in April. 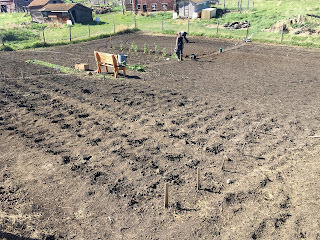 I planted all kinds of delightful heirloom varieties (Brandywine Beefsteak, Amish Paste, Black Prince, Mountain Princess, Carbon Beefsteak, Radiator Charlie's Mortgage Lifter.... to name a few), eagerly anticipating the bounty that Fall would bring. (Note: tomato seeds are deceivingly small.) 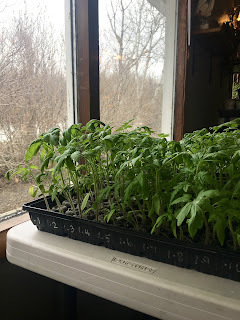 I had to transplant the baby tomato plants a couple of times before putting them in the garden at the end of May, at which time I tried to remember how crowded the tomato patch was last year, and leave adequate room for all of the plants. I didn't have enough room for 130 tomato plants. The tomatoes were the last thing to go into the ground, and the rest of our garden was full. Well, I couldn't just let them die. 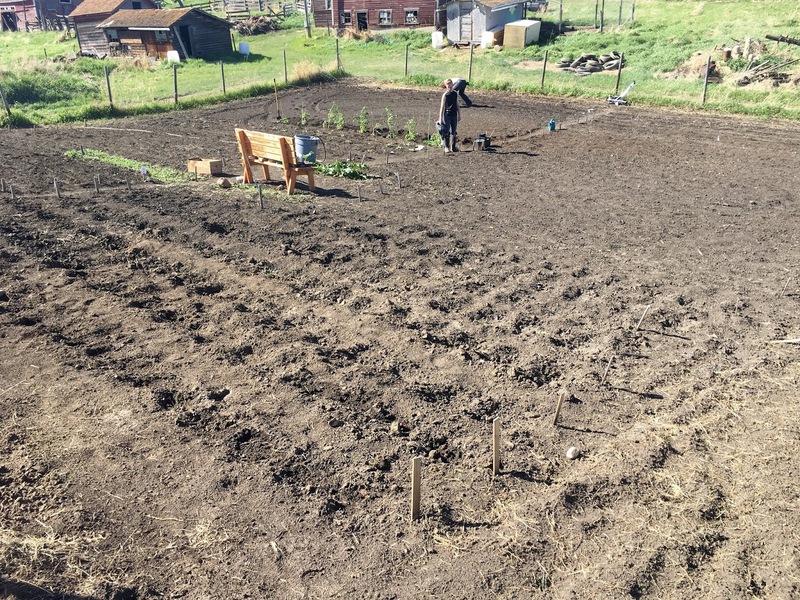 So my husband graciously tilled up another garden south of our existing monstrosity, where the remaining 40 plants were nestled into the lovely, loamy earth. 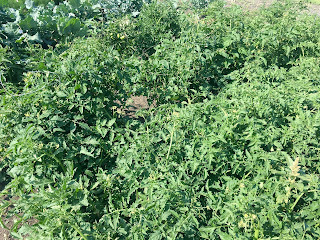 Fast forward to August, and we were picking gorgeous, ripe tomatoes with some regularity. And then at the end of August, the temperatures dropped, and we got a bit of frost. Not good. Way too early. 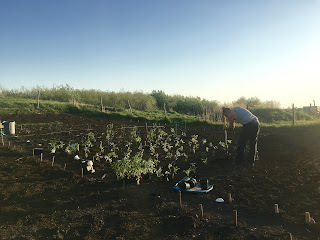 He dutifully covered the plants overnight, every night, until we had time to start harvesting. We started bringing in the green tomatoes, filling cardboard Costco flats in single layers and placing them on our cellar shelves. When the cold weather really started to hit, we did a major picking... and wound up with a basement absolutely FULL of tomatoes. The cellar shelves are full, and there are newspapers on the floors in the library and the entertainment room, just covered. You could pretty much watch them ripen, too. We sort through them every day (and by 'we' I mostly mean 'Jim', who does all the real work around here), looking for ripe or spoiling ones. The ripe ones mostly get cored and thrown in the freezer for later use, and the spoiled ones go to our henny pennys... nothing is really wasted around here. Ok. Why? Why in the world would someone with a full-time career plant 130 tomato plants, on top of all the rest of the garden? Insanity? Perhaps. But really. The goal was to grow enough tomatoes that we won't need to buy any canned tomatoes this year. 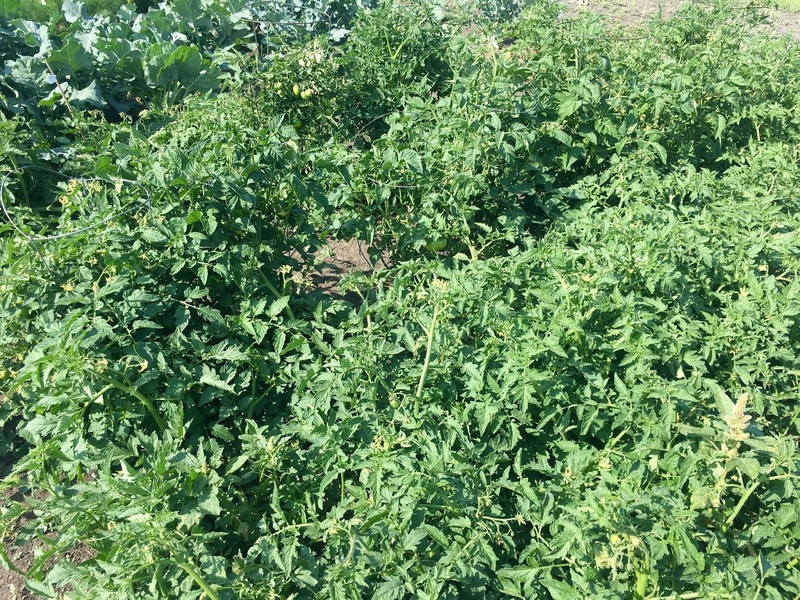 Last year, with 100 plants, we wound up with enough tomato product to last us til June. So this year, we wanted just that bit more. I'm canning our own diced and crushed tomatoes, tomato sauce, and tomato paste... and this year I'm doing more of it. Last year, the beautiful rainbow of tomatoes made me want to do more than just can them, though.... so I decided to try a few batches of salsa until I found one we loved. We eat a lot of salsa in this house. Of course, you have to wait for salsa to properly mature before you taste it, and then you need to compare your various versions to decide which one is the winner. I'm happy to say that we worked all of this out last year, and wound up with a really great salsa that we're happy to share. Today was time to make it again. If you'd like to join us, I'm happy to share the process. This is a pretty, flavourful salsa that we all enjoy. You can make it to your own heat specifications, too, by adjusting the quantity and type of peppers that you have. I use a mix of everything from jalapenos to serranos to thai chilli peppers; whatever we grow that year. Our salsa spice profile is a solid medium. Fill a large bowl with cold water and add ice. Core each tomato, and cut an "X" in the bottom. Drop tomatoes in boiling water, just a few at a time. After 30 seconds (or when you see the skins starting to peel), drop them in the ice water. The peels should come off easily after this. **Note: When chopping your hot peppers, you decide whether to remove the membrane and seeds or to leave them in - leaving them will result in a kickier final product! Please, when dealing with hot peppers (and even garlic), consider using rubber gloves. There's nothing like rubbing your eye after making salsa and realizing you still have capsicum on your fingers. Trust me. Prepare your canner, jars and lids - bring your canner water to a boil (slightly more than half full), thoroughly wash and rinse your jars and put them in a 120-140 degree oven on a cookie sheet to keep hot, and place your seals into a pot with just-simmered water, keeping them as hot as you can. Ladle hot salsa into hot jars, leaving 1/2" headspace. Wipe rim, and screw down rings onto seals until just fingertip tight. Place jars in canner and ensure they're covered with 1" of water (you can ladle some water out if needed). Cover, bring to a boil, and then set your timer for 15 minutes. Turn off the heat, remove the lid, and wait 5 minutes. Then remove the jars and place on a towel on your counter. Do not disturb for at least 12 hours. After that, ensure that jars have all sealed, remove rings, wash jars, and store in a cool, dark place. Did you have too much to fill a final jar? That's ok! Put it in the fridge and enjoy it over the next couple of weeks. This salsa gets better with age! Give it a few weeks before cracking a jar.